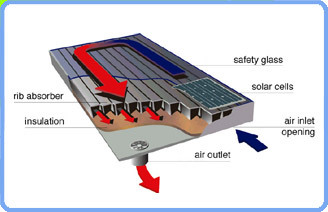 The fresh air from outside is led through a collector (Fig 1). Inside the collector the air is heated up by the sun. The built-in ventilator transports the warm air directly into the rooms via insulated pipework. As a photovoltaic cell provides the ventilator with electricity, the sun determines when and how much warm air is conducted inside. You do not have to take care of anything and can look forward to going on holiday without the need for worry. You can turn it off via the control panel or you can use a TOPSOLAR system in order to heat your hot water in the summertime. You can mount TWINSOLAR according to your taste and imagination! You can mount it onto a roof or a wall, either vertically or horizontally or you can simply put it on a rack that is attached to the floor. The high-quality materials used are guaranteed to be highly durable so you will not incur rising costs. It is easy to operate and maintenance free except for changing the filter.